Any nutter can make a complaint to a regulator, its the idiots who act on vexatious complaints you have to wonder about. Amit Patel’s Freedom of Information request to the CHRE. 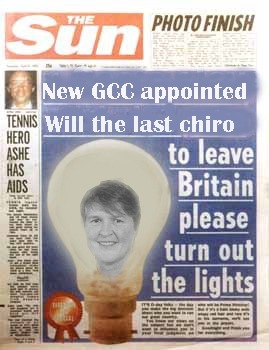 Obviously she got a glowing reference from Peter Dixon et al as they thought she had done a great job bringing the chiropractic profession to its knees now she is to turn her attention to Alexander technique, Aromatherapy, Bowen, Hypnotherapy,Massage,Naturopathy, reflexology, etc etc and do the same to them. Like Coats, Greg Price was forced out nevertheless was able to get the exact same job for the regulator for psychotherapists until members found out what he had been up to and they forced him out. Lets hope the same happens to Coats, but I doubt it its called cronyism. CNHC Board is delighted to announce the appointment of Margaret Coats as Interim CEO/Registrar from 1 September 2011. Margaret was CEO and Registrar at the General Chiropractic Council until April 2011 and has recently been working with CNHC in an advisory capacity. She has an impressive career pathway, including roles as CEO of the Occupational Standards Council for Health & Social Care and Head of the NHS Open Learning Unit. Margaret will be working 3 days a week initially, whilst undertaking a review of the organisation’s structure and functions. The CNHC Board, at its meeting on 2 August 2011, expressed its gratitude and appreciation to Maggie Dunn, who stands down as CEO/Registrar from 31 August 2011. Recognition was given to the huge amount of progress that CNHC has achieved since its inception, a significant amount of which has been due to Maggie’s tireless involvement. Tribute was paid to the time and effort she has given to the organisation since 2008, particularly in building up excellent working relationships with the CNHC’s Professions Specific Boards and Professional Associations. Her skills in mediation and problem solving have proved invaluable in bringing different groups together, to recognise how much they have in common, as well as celebrating their own unique features. Hi I am doing well was in France last week learning to surf. Have finished radiation and first course of chemo and am having my areshole removed on the 24th. I will send it to the GCC so they can use it to chair meetings. what ever reason, mostly are no longer in practice. Isn’t it odd how she was moved onto this board – has someone got medicalisation of these therapies in mind? 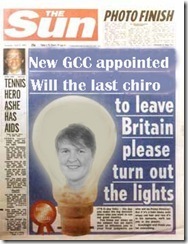 BTW hope this chap is better on the GCC than that turd coats ….